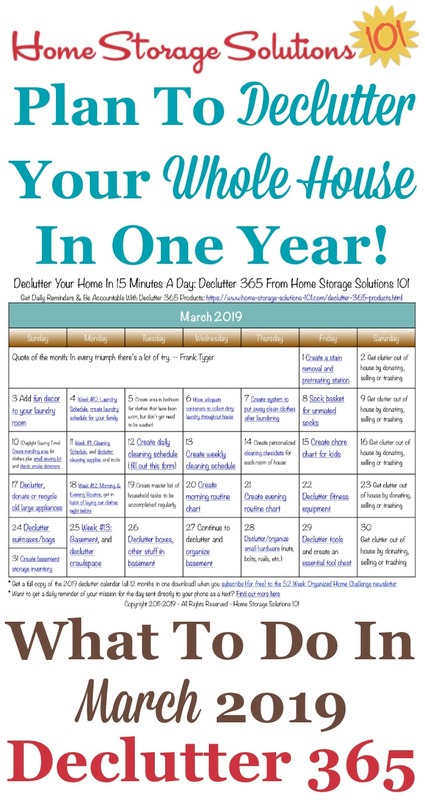 Here's the March 2019 declutter calendar with a daily 15 minute decluttering and organizing mission for each day of the month. 1. 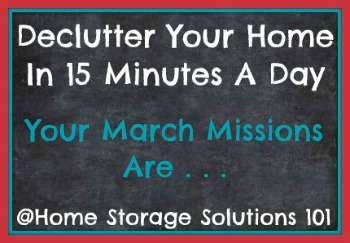 Work for 15 minutes to declutter and do the mission listed, and if you need to work longer, and have the time, go for it. However, don't feel obligated to. 2. Print off the printable version of this calendar if you want to post on your fridge or some other area of your home to remind you what the daily mission is. To print it off scroll down on this page and click the picture of the calendar itself, or click the link directly under the calendar which says, "click here to get your printable March calendar." 3. Get a daily reminder of the day's missions, sent directly to your mobile phone, with text messages. Find out how to sign up for text messages here. In addition, you can also follow me through social media, including Facebook, Instagram, and Twitter, to get a daily reminder of the day's mission, although I can't guarantee the algorithms will show them to you. Plus I've created a Declutter 365 Premium Facebook group for annual or monthly subscribers that you can join to motivation, encouragement, live weekly video group coaching sessions, plus comraderie from others who are also working through the Declutter 365 missions. 4. 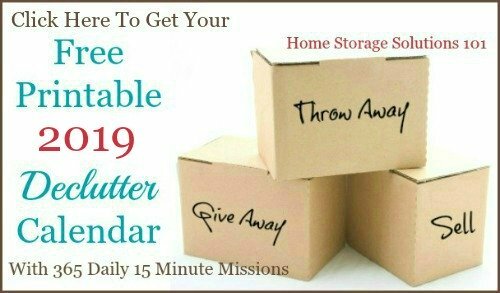 If you're loving this month's calendar (which you can get below without subscribing) you can get the entire 2019 declutter calendar, all 12 months, by signing up for the free newsletter. Currently the entire calendar is only available to subscribers, although March 2019 is available for everyone. 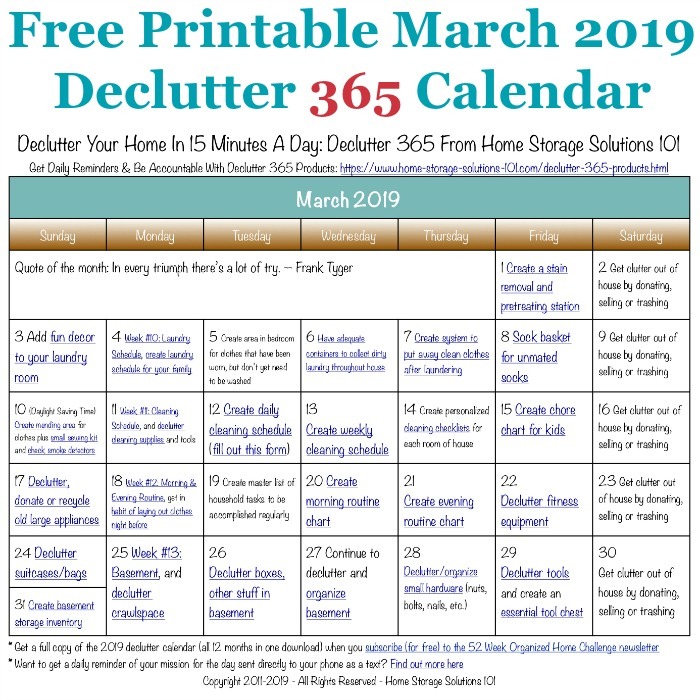 Sign Up Here To Get Your Free 2019 Printable Declutter Calendar! 5. Once you've accomplished any one of these missions you can share your photos of what you have decluttered with me in the Getting Clutter Free Hall of Fame. 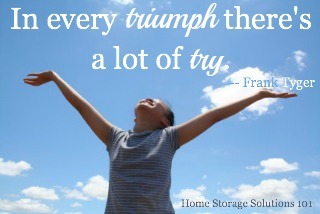 Plus, get some inspiration from the quote of the month, below. Please note that the texting service only will text to U.S. based phone numbers, so only get this if you've got a U.S. based number. Along with daily reminders, getting support through motivation, encouragement, and help when you need it can make the process of decluttering your home much easier, and give you the tools to succeed. To help with all these tasks I've created a special, private and exclusive Facebook group that you can join where I can help you with group coaching through the missions and tasks, and you can also get help and support from like-minded Declutter 365 participants as well. Both annual and monthly subscriptions to this private Facebook group are available. 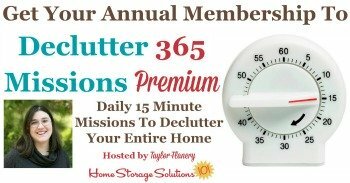 Find out how to join the Declutter 365 Premium Facebook group here. Here's a printable version of the calendar of daily missions that you can use. To print it is easy. Merely click on either the image of the calendar itself, or the words below which say, "click here to get your March Printable Calendar" and a new window will open with the PDF. Please note there are ads on this page. If you are asked to download something to get this calendar you've not clicked on the right thing. There is nothing to download to get this PDF! 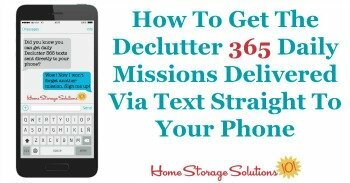 I've got more free products, as well as add-on Declutter 365 products, such as text messages and a private and exclusive Facebook group that can help you get your home decluttered this year. 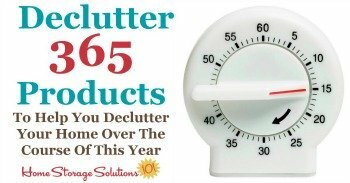 Make sure to check out all the Declutter 365 products available here. Do You Want Next Month's Calendar Too? 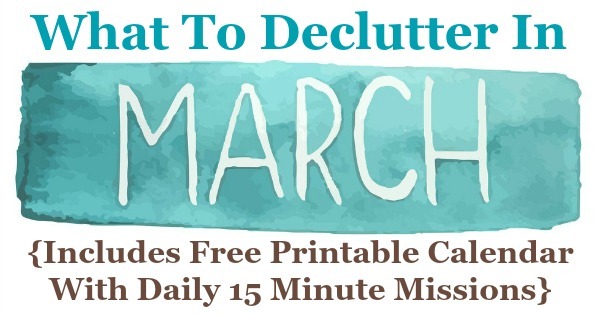 You can also get the April decluttering missions here (including printable calendar). In addition, if you'd like the entire 2019 calendar now, it is available automatically to all newsletter subscribers (the subscription is free) so sign up today if you haven't already!